Award Year: 2006 Approximately one in nine U.S. residents is now foreign born, and both immigrants and their children are significantly more likely to be uninsured than the native population. Health care facilities face challenges in coping with rapidly growing numbers of diverse immigrant patients who are poor, uninsured, and often unable to speak English. Alejandro Portes, Ph.D. examines how well health care organizations are meeting the needs of immigrant patients, and what accounts for performance differences. His project, Immigration and the Health Care System: An Institutional Analysis, focuses on 45 hospitals, community clinics, and health care centers in Miami, San Diego, and the Trenton-New Brunswick corridor in New Jersey to evaluate their capacity to cope with uninsured immigrants and overcome barriers to effective care. Dr. Portes' results should inform policy efforts to address the health needs of immigrants and help ensure that health care organizations respond effectively to an increasingly diverse society. 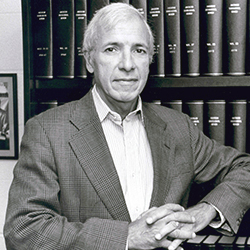 Alejandro Portes is Howard Harrison and Gabrielle Snyder Beck Professor of Sociology and director of the Center for Migration and Development at Princeton University. Previously, he taught at Johns Hopkins University, where he held the John Dewey Chair in Arts and Sciences; Duke University, and the University of Texas-Austin. In 1997, he was elected president of the American Sociological Association and served in that capacity in 1998-99. He was educated at the University of Havana, Catholic University of Argentina, and Creighton University. He received his M.A. and Ph.D. from the University of Wisconsin-Madison. Portes is the author of some 220 articles and chapters on national development, international migration, Latin American and Caribbean urbanization, and economic sociology. His books include City on the Edge: The Transformation of Miami (California 1993), co-authored with Alex Stepick and winner of the Robert Park Award for best book in urban sociology and the Anthony Leeds Award for best book in urban anthropology in 1995; and Immigrant America: A Portrait (California 1996), designated as a Centennial Publication by the University of California Press. His current research is on the adaptation process of the immigrant second generation and the rise of transnational immigrant communities in the United States. His most recent books, co-authored with Ruben G. Rumbaut, are Legacies: The Story of the Immigrant Second Generation and Ethnicities: Children of Immigrants in America (California 2001). Legacies is the winner of the 2002 Distinguished Scholarship Award from the American Sociological Association and of the 2002 W. I. Thomas and Florian Znaniecki Award for best book from the International Migration Section of ASA. He has published articles on immigrant transnationalism in the American Sociological Review (2002); American Journal of Sociology (2003); and the International Migration Review (2003). Portes is a former fellow of the Center for Advanced Studies in the Behavioral Sciences and of the Russell Sage Foundation. He has received honorary doctorates from the New School for Social Research, the University of Wisconsin-Madison, and the University of Genoa (Italy), as well as the Distinguished Career Award from the Section on International Migration of the American Sociological Association. He is a fellow of the American Academy of Arts and Sciences and a member of the National Academy of Sciences. Fernandez-Kelly, P., Portes, A. Health Care and Immigration - Understanding the Connections. Journal of Ethnic and Racial Studies, Sep 6 2011, 1-2. Portes, A., Fernandez-Kelly, P., Light, D. Life on the Edge: Immigrants Confront the American Health System. Journal of Ethnic and Racial Studies, Aug 31 2011, 1-20. Portes, A., Light, D., Fernandez-Kelly, P. The U.S. Health System and Immigration: An Institutional Interpretation. Sociological Forum, 2009, 24(3): 487-514. Portes, A., Fernandez-Kelly, P. (eds.). Health Care and Immigration: Understanding the Connections . New York: Routledge, 2012.